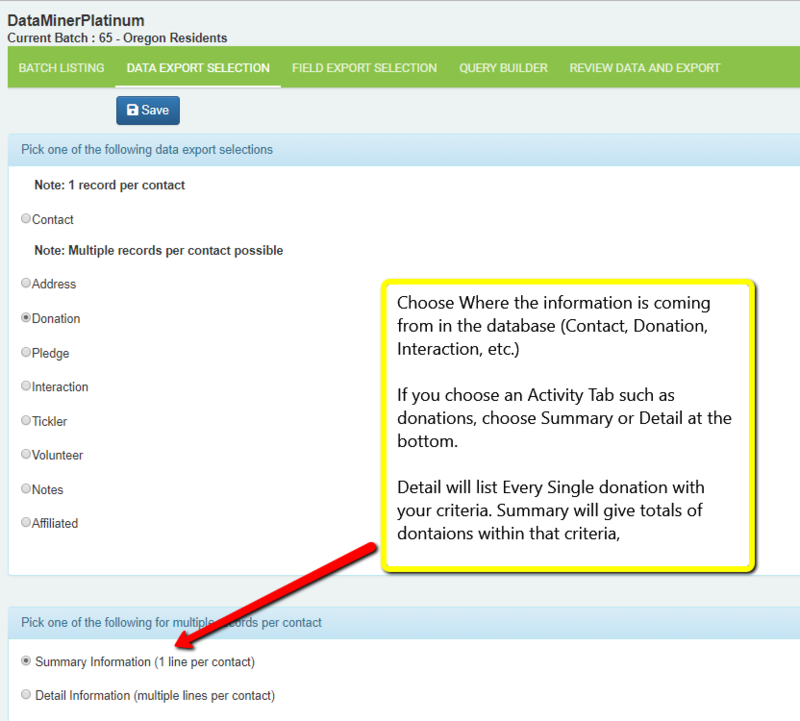 The Data Export Selection step is where you determine which table (the type of records like contacts or donations) you will be primarily looking at in your query. For example, if querying how many donations to a specific Campaign, you need a “Donation” reports. The Contact fields will be available in Every report. For example, by running a “Donation” report, all fields on the Donation tab PLUS all fields on the Contact tab will be available. Only one activity table (Donations, Interactions, etc.) can be included in a report. In order to report on two fields, run two different reports and consolidate in Excel. If choosing an activity table, then only contacts with at least one of those types of records will show up in the results. If you run a Donation query, then only contacts with one or more donation records will be able to show up in the results, even if you don’t add any donation criteria. Detail: will give you ALL donations, listing contacts multiple times if they meet the criteria. For example, all DONATIONS to the Capital Campaign, where it might list Bob Smith multiple times because he donated 5 times.